My new apartment was completely remodeled and everything in the kitchen is brand new. I am the first person to cook on the stove and put food in the refrigerator. Wonderful, but a little scary. I’m afraid to get it dirty. Lol. I am doing a lot of wiping up and shining. The cupboards were so new, I had to wipe out the sawdust before I put in my stuff. I have a south-facing window in the kitchen, and had the landlord cut off the top of a tree so the sun could shine in. I haven’t figured out where the good light for shooting is yet, but that will come. I have two additional shelves in the kitchen, a bookcase with all my prop dishes, and a metal wire shelf for all my cooking equipment. It’s great to have everything right at hand. When I went through my old garage, I found some interesting stuff I had forgotten about, like a cast iron Dutch oven and some little copper casseroles with handles. I found my stash of about a thousand flash cards I used for studying when I was in culinary school. I may start asking you those questions and see how much you know. I also discovered two cartons of recipes I clipped from about 1993 through 2000. I was working full time, going to culinary school and had a little kid in school, so I guess I just threw them in a box. I looked at every one, threw most away and realized… guess what, there are no new recipes. Just variations of the same ones, over and over. Remember last May when my son got married and I learned to make spring rolls? And I made a bunch of different dipping sauces? Well, the peanut sauce on this salad is one of the dipping sauces for those spring rolls. It is so delicious on this salad, with the crispy tofu and crunchy veggies, along with the chopped peanuts, sesame seeds, cilantro and sliced green onion garnishes. You really could use any vegetables that suit your fancy and the tofu doesn’t need to be fried. I had it plain and was just as happy. I hope you give this a try. P.s. I am very glad to be back. 1. Heat oil in large non-stick pan over medium heat. Add tofu cubes and cook, turning, until crusty on all sides. Drain on paper towel lined plate. 2. 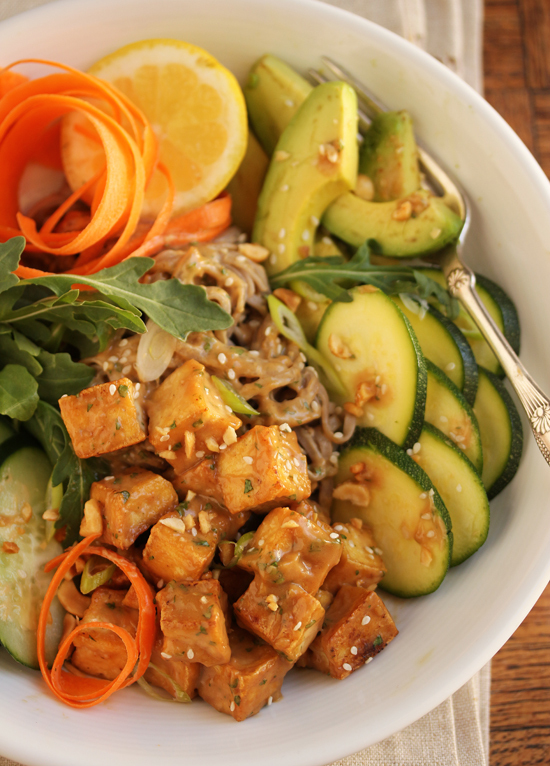 Arrange soba noodles, vegetables and greens in large salad bowls. 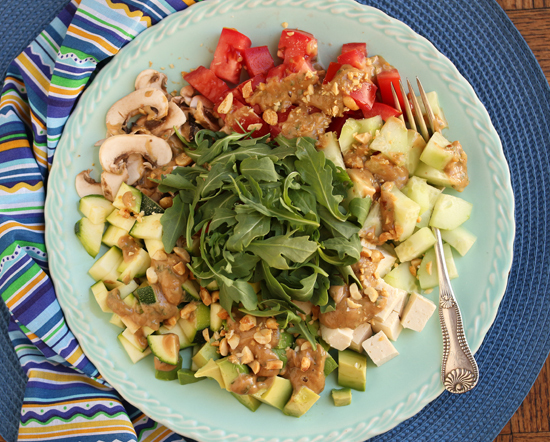 Drizzle with the peanut sauce, to taste, and garnish with peanuts, sesame seeds, cilantro and green onion slices. Pass more peanut sauce at table. 2. Add the peanut butter and sugar, and cook, stirring, 1 to two minutes, until sugar is melted. 3. Add coconut milk, broth, lime juice, hoisin and fish sauce, whisking until smooth. Bring to a simmer and cook, stirring occasionally, until thickened and reduced to about 1 ½ cups, about 45 minutes. Add basil, if using, and cool to room temperature. Can be made 3 days ahead and refrigerate in airtight container. Serve at room temperature. Wow, this looks amazing! Welcome back! This is dinner tomorrow night. Have a great w/end! Missed you and your gorgeous dishes. Glad you have settled in.